What’s the biggest worry government agencies have before giving awarding a contract? It’s not the money. It’s whether the person they gave it to will deliver. How you write, phrase, and position references and endorsements in your proposal will influence how evaluators respond to your bid. Don’t make the rookie mistake of copying and pasting in quotes from sponsors without giving thought to their phrasing, weight, and message. But let’s back up first. 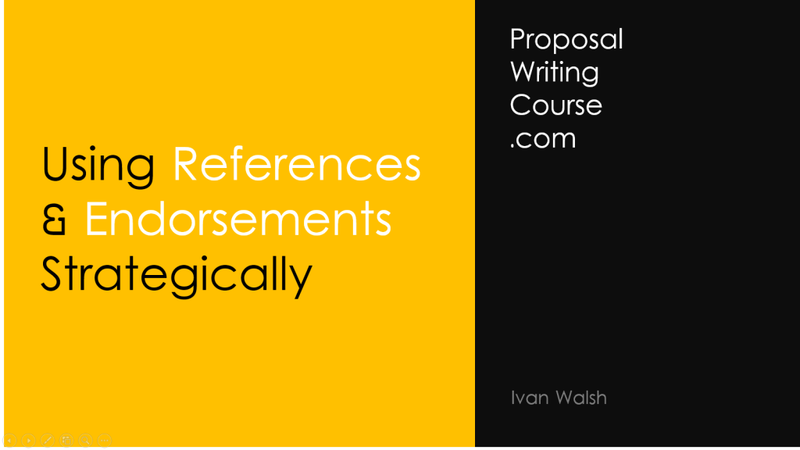 This brings us to using references and endorsements in proposals and grant applications. Most grant providers and government agencies will request references in the same way you provide references when going for a job. Sometimes, not always, these are contacted to confirm that you provided the work you said you did. However, there are other ways you can use references and endorsements for proposals, bids, and grants that have more impact. Here’s a suggested approach. When a project finishes, contact several people on the client side and ask them what went well, poorly, and could be improved. Use this to help improve future projects. After this is completed, ask the client if you can use some of the comments in reference materials, for example, proposals. Note: your aim here is to improve the projects (i.e. it’s not a trick to get a quote) but then use them to get natural sounding endorsements you wouldn’t get otherwise. Once you have this, compile a library of quotes, endorsements, and remarks that you can insert into different types of documents. The key here is to have a selection of endorsements you can use. Many proposal bidders are limited to a small handful of endorsements. You want to avoid this so you have more flexibility and also so that your proposals don’t stagnate. Let’s talk about the actual wording of the endorsements. Using a Q&A checklist is a very helpful way to elicit recommendations as people when responding will write in natural everyday language. If you ask people for a quote they’ll freeze. I’ve never written any endorsement before? What’s the one thing that worked best? Where do you think we could improve? Do you have any advice on how we can improve? If you ask questions like this – and sending them by email is fine as people often like to think before answering – you’ll soon build a nice library of quotes. Get permission to use these. Some companies prefer not be quoted. In this case, simply say, for example, Project Manager for Multinational Healthcare Company. Keep the quotes to two or three lines. You can pepper these throughout the bid. Now that you a have a selection of endorsements for different parts of the bid documents, insert these through-out the document where they will have the most impact. You can add these in the margin, as notes, or using a specific font so they stand out. The point is to match each endorsement or recommendation with the appropriate section in the bid. If you do this in an understated way in each chapter, it has a cumulative effect. The reader can’t help but be impressed. Because the recommendations are not canned quotes but designed to support that specific section in the proposal. If done correctly, it’s very impressive.